PLAZA DEL TORO is a private event space, gastronomic society, and modern test kitchen in Portland, Oregon’s Central Eastside Industrial District created by restaurateur John Gorham, chef/owner of Portland’s celebrated Toro Bravo, Tasty n Sons, Tasty n Alder, Mediterranean Exploration Company (MEC), Shalom Y'all, and BYH Burgers. Gorham envisioned a space where he and his staff could have unconstrained culinary creativity as they develop new recipes for his properties, as well as experiment with new and innovative dinner concepts inspired by the legendary Portland supper club that Gorham founded, Simpatica, and the gastronomic societies of San Sebastian, Spain. The beautiful 4,000-square-foot space can accommodate events of all kinds from a large-scale dinner for 90 guests to a cocktail party for 150. The beautifully renovated industrial space features an oyster bar, a professional DJ booth, and noise-dampening, double-paned, floor-to-ceiling windows offering views of passing trains. The kitchen boasts a large Combi oven and a six-foot grill with whole animal rotisserie inspired by Getaria, the mesquite grilling capital of Spain. PLAZA DEL TORO also serves as home base for pastry chef Ashley Claybaugh who develops all Gorham properties dessert programs. To inquire about hosting a private event, contact inquiries@plazadeltoropdx.com. John Gorham is Co-Owner and Executive Chef of iconic Portland restaurants Toro Bravo, Tasty n Sons, Tasty n Alder, Mediterranean Exploration Company, Shalom Y'all, and PLAZA DEL TORO. Gorham believes that a chef’s cuisine and style is influenced by a trade route composed of travels, past work, cities lived in, and foods that their family made growing up. A ‘chef of the people’, Gorham celebrates a range of global cuisines at his influential restaurants; each with a unique identity but all embodying the quintessential Portland dining experience of family-style dishes, house-made charcuterie and seasonal sustainably-sourced ingredients. Michael began his culinary career volunteering part-time at a sushi bar on the weekends until he was good enough to accept the lofty title of “Sushi Apprentice” for $7 an hour and eventually became the head sushi chef at Aubergine in San Diego. After 15 years of sushi in the San Diego area, he left California for culinary school in Las Vegas, where he started working for his first Michelin-starred restaurant, the acclaimed Andre’s French Restaurant. From Andre’s he worked at Koi in Planet Hollywood, RM Seafood in Mandalay Bay, and opened Bar Masa in Las Vegas, which soon moved him to the 3 Michelin-starred Masa in New York. Michael went on to work for April Bloomfield, David Burke, and was a sous chef for Masaharu Morimoto. In his spare time, Michael enjoys cycling, going to the gym, and preparing for the zombie apocalypse at Washington Park Archery Range. Originally from Iowa, Katie brings hospitality to every client. It was a wonderful place to grow up but she sought excitement and experience in her young adulthood. In her late teenage years Katie became a SCUBA instructor which brought her to exciting and beautiful locations. She eventually settled down on the island of Maui, spending several years there before moving it Portland. During her first year in Maui she met her husband who who opened her eyes to the culinary industry. She retired her dive mask to don a busser apron at one of Maui’s top fine dining restaurants, Lahaina Grill. Later, Katie started a full time job working with Maui Land & Pineapple Co as a concierge at the Kapalua Adventure Center. She sold activities to tourists, informed them where to dine, where to hike, play, and relax. It was the perfect combination of selling tourism during the day, and being involved in a fantastic restaurant at night. After 6 years on Maui, Katie wanted to broaden her hospitality experience in a food focused city. In 2010 she moved to Portland with her husband and their dogs. Katie worked as a lead hostess at Urban Farmer located at The Nines Luxury Hotel where she received her appreciation award of “Associate of the Quarter”. She later became the private dining manager at Andina Restaurant in the Pearl District, one of the city's top restaurants for private events where she honed her sales and coordination skills. In the summer of 2015 she joined the Toro Bravo Inc. family and became the Director of Affairs at PLAZA DEL TORO, a gastronomical society event space. Born on an air force base in Grand Forks North Dakota, Mindy was raised in Iowa and has been a Portland resident for 10 years. Mindy has been in the restaurant industry, working as server, bartender, bar manager, floor manager, wine steward, etc. for over 22 years. She has worked for the John Gorham team for nearly 8 years. 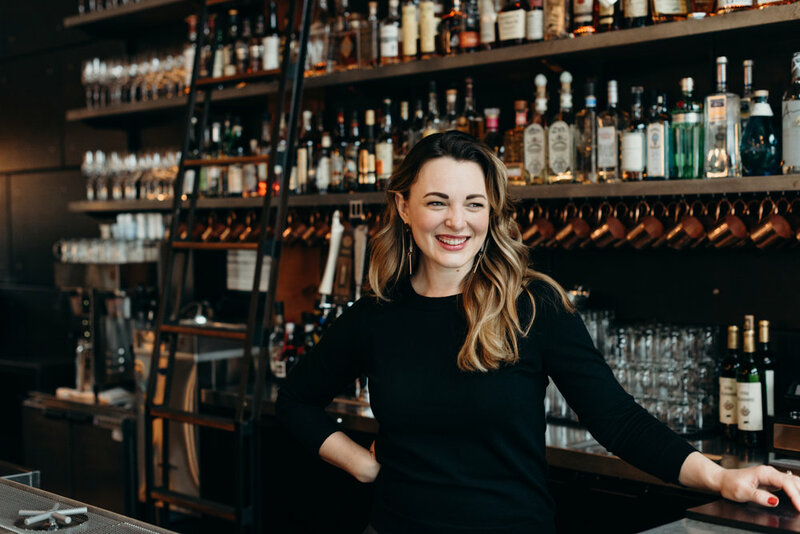 She spent several years behind the bar at Toro Bravo before opening Tasty n Alder and not only oversees the beverage program for all five restaurants but is also the wine director at each location. She curates a unique wine concept at each restaurant. At PLAZA DEL TORO Mindy offers clients customized wine pairings and cocktail offering tailored to your menu and event.